Noise-Cancelling Microphone – Blocks background noise for clearer conversations. 6 Watt VHF – Select between 1, 3 and 6 watts for short and long range communication. USA, Canada & International Channels – Allows operation on any of the three different channel maps established for these areas. All NOAA Weather Channels and Weather Alert – Instant access to national All Hazards and weather information, 24 hours a day, and alerts if threatening weather is nearby. The best value in our handheld VHF radio line up! Backed by 50 years of Cobra® quality, this floating radio has an orange core for higher visibility and is easy to retrieve if dropped overboard. 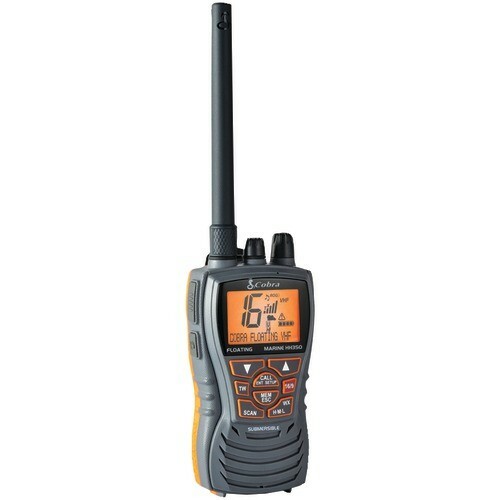 It features 6 Watts of power for longer range communications and full access to all NOAA weather channels and alarm tones for weather emergencies.